You looked up directions to the restaurant where you have an appointment and you now want to send an email of the map to your disciple. OR . . . You found a great article and photo and want to print just that part of the website to mail to your mother-in-law instead of the whole three pages. I wonder if other keyboards around the world are not laid out in the same way. 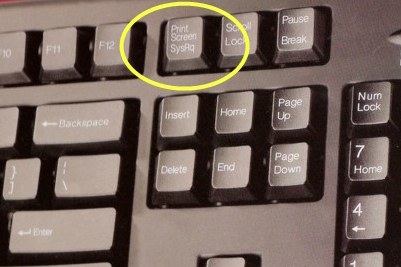 You may have a “Print Screen” key in another location on your keyboard than I do. If anyone knows about other keyboards, please comment here. Vista users: read the comment from Curt. Mac users: click here… and notice you will find more tutorials on the site, too. NOTE: This post is in the Keyboard Tips Series. It will copy or save anything on your screen in almost one step. I added a “Vista” tag on this post so someone can find your comment. I’m using print Screen on my Linux system and it has a good soft for that! You can make the region for the screenshots on every web page you want! I like this soft for Linux and maybe Windows has same soft somewhere,I don’t know. Next Next post: Unplugged or Plugged In?